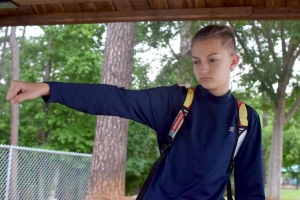 LAWRENCEVILLE, GEORGIA, UNITED STATES, February 5, 2019 /EINPresswire.com/ -- Russell Horning1 has created a worldwide phenomenon through his Backpack Kid2 handle and his quirky, viral-worthy dancing videos. Through his rising fame, however, Russell Horning has been a proactive supporter of charities and outreaches and spreads positive values and messages through his internet following. His whacky dances have been incorporated into pop culture through memes, video games, television shows and more. Russell Horning has quickly become an inspiration to hundreds of thousands of kids, and he’s mindful to use his fame to spread positive messages and give back to society. Backpack Kid began performing at an early age at the Aurora Theater of Gwinnett County. Today, he continues to support the theatre. However, he keeps plenty busy between his rising fame and his charitable efforts. He’s appeared at underprivileged elementary schools to give impromptu performances and hand out backpacks full of supplies to students. He supports many charities and events (such as the Boys and Girls Club of America) and raises awareness and funds for various organizations, even donating personal belongings to auctions. During the holidays, Russell Horning gathered his friends together to spread a little holiday cheer to those in his community. He and other volunteers surprised families at their homes with gift donations and iconic performances to brighten their day. He’s careful to keep his fans in mind and lend a helping hand to those who truly need it. When one of his “Flossing” fans suffered an injury that eventually led to the amputation of their leg, Backpack Kid Russell Horning wrote to him and sent an autographed photo to show his support. To fans earning distinctions or positive recognition, such as earning the acclaimed Eagle Scout badge.